Ta strona jest również dostępna w języku polskim. LINGOT is an easy to use, accurate, and highly configurable instrument tuner. 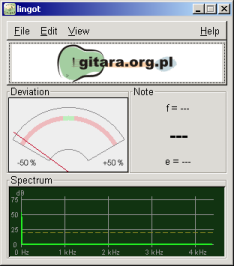 This web page is about Windows version of Lingot, ported by gitara.org.pl team. If you use a different OS, please visit http://www.nongnu.org/lingot. Windows 2000 / XP / Vista, CPU at least around 1GHz at default settings. The calculations do not require a fast CPU, but the GTK GUI seems to be quite CPU heavy on Windows. Download the program and run it. You should see its main window as seen on the right. Playing the instrument should cause a clearly visible response on the frequency spectrum plot, provided the input is connected to the sound card, and the mixer is configured properly. It is usually a good idea to set the input volume in such a way, that the signal is strong but the background noise do not cross the dashed line on frequency plot. The fastest way to tune an out-of-tune instrument is by looking at frequency display on the right side of the window, because it allows to exactly tell how far the sound is from the target frequency. Beware though, that in some circumstances the program may not show the fundamental frequency, but instead lock on some harmonics. When tuning instruments that are only a little out-of-tune, the easiest way is just to look at the needle, and try to position it in the center. The repository can also be browsed using WebGit.